From Local to Global - the boundaries today cease to exist. It’s no more 'Global' that’s talk of the town, the new success mantra for the corporate world is being “Glocal”, Global with a local flavor. “Gloconomics” is a platform to discuss the macro economic issues that have cropped up or are emerging in this newly glocalised era but are yet unsaid or hidden. Einstein said these words more than 6 decades ago. And I must say the extent to which Technology has reached today, it has crossed all barriers of imagination and thoughts one can think of. Especially with the invention of Internet, followed by Smartphones; technology has outlived the above statement literally. Remember the endless laughter you enjoyed with family/friends last time! It was amazing isn’t it? If I ask you to narrate me the whole situation, you can relive the good times you had. Now, do you remember the last time you typed ‘LOL’ on watsapp? Pretty short lived isn’t it! What’s missing? The soul is missing - touch is missing. We are not living in the era of technology but touch-no-logy. I am afraid with every step of advancement in technology we are losing touch with the person. We have more devices than ever to communicate but people have never felt more isolated. There is a big difference between the efficient passing of information and truly connecting with each other to build and maintain relationships. The ‘smart’ touch can never be smart enough to replace personal touch to things and people. This leaves me with a question to how far words and media can capture your true feelings and emotions. No doubt, technology has come a long way with real time transmission of a part of you by way of skype, watsapp, facebook etc. but still something feels missing somewhere. With technology, we are connected but not. We are closer but not. We can be efficient & quick but not empathetic and available. 8th Nov, 2013 - 1915 hrs local time, I am writing this from Charles De Gaulle Airport, Paris while waiting for the boarding of my flight to Dubai. And the reason I have to write it right now is the mixed feeling I am having at this moment. I see both happy and sad faces around. 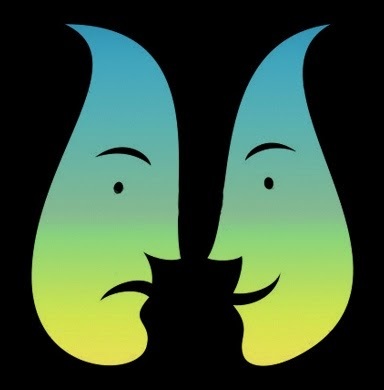 But more interestingly, some like me, are neither happy nor sad or may be both happy and sad at the same time. On one hand I am excited to be home soon but on the other hand I am sad to go through the long tiring flight of 7 hours again!!! Life is a roller coaster ride! Everyone believes in that and lives with it. But just imagine if you are rising and falling at the same time…like being sandwiched in the concurrent gears where one is moving clockwise and the other anti-clockwise. Surely it will be a big mess! Last few months have probably been the same for me and eventually made me learn this word – “Sappy”: Being Sad and Happy at the same time. Those who are around me, know why! Anyways, to me Life is nothing else but ‘Living In Funny Events” but unfortunately this funny-ness is not always funny. The irony of the fact is that while we can absorb any amount of happiness whenever it comes to us but we get worried by small little jerks in life at times and thanks to our spiral thoughts; we do our best to let this jerk turn into a tornado in our lives. God save u when we really have a tornado at first place. I am confused whether ‘Sappy’ is a natural transition when you move from sadness to happiness or is it a quest to be happy which forces you to do things that would possibly bring some happiness in your life while you are completely broken? Whatever it is, I seriously feel it’s a very powerful state that has the capability to turnaround the things around you if you wish. This is exactly like stretching the string of ‘bow with an arrow’ where either you drop the arrow while feeling the pain in your fingers or just feel the power you have brought in the arrow by stretching the string and aim & hit the bull’s eye. It all depends on whether we learn to make peace with our past and work towards a better future. In other words, can we be ‘sappy’ consciously!?? Your past might pull you back making you sad every now and then but what can really work is gathering small little happiness and fighting your way out! Life is a journey where unfortunately we remember only the past but the fact is that, if at all we can change something, it is the future!!! Just had one of the tough days of my life yesterday. Nothing unusual, of course. Everyone has crests and troughs in their life but not very frequently we would be happy to have that day. For me, yesterday was one such day because the situation I was in, made me ponder upon numerous situations when we are simply clueless about what to do next! And there came my next blog: “When mind fails!” In line with the theme of Gloconomics: Expanding hidden issues, this blog is a true effort to pen down all such situations when it becomes extremely difficult for us to take a call. We are either helpless or incapable or unaware of the situation but whatever it is, end of the day we are left with no solution. Since it is creation of my mind I believe I might have been through these situations although I do not remember them now (It’s good to forget at times!!!) and I am sure you would have been through most of them by now. Let me know your thoughts! I am sure you will cherish it more if you go slowly, one-by-one on each of the below point. 1. When you are speaking the truth but you think that the other person is thinking you are lying and you have no objective means to prove that truth. 2. When you desperately want someone to do something but you cannot straight away ask for it because saying it will definitely spoil all the goodness that act is supposed to bring and it is quite likely that once spoken verbally it will rather have a negative impact if done afterwards. 3. When you really want to express to the other person what you feel about him/her but you think that saying it will make it look artificial and planned and might not reflect your true feelings. 4. When you sacrifice a lot for someone/something but that doesn’t get evident and on top of that is taken for granted. 5. When you love 2 people and you are trapped in a situation where giving happiness to one is bound to hurt the other. And you in between do not need anything for yourself just that you want the other two to be happy. 6. 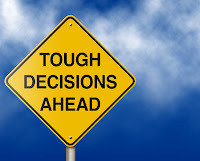 When you have 2 options in hand – one challenges your self-respect, is uncertain and makes you accept whatever happens to you due to other’s actions but is surely a lesser loss option, while the second demands your strict stand on one thing, is certain with lesser gain or higher loss at the end of the day. Which one to take? 7. When you have to take a call between time and money. 9. When you are striving for something you don’t have and you also know you can’t have it by any means. It is literally impossible for you at least in this life. 10. When you see something going wrong but you think that your involvement will make it worse. Although, you never know! So what would be your stand…to struggle with your mind to get a solution or leave it on fate? In this case, the 2nd half of the quote “…Many of the things you can’t count, really count” triggered a very genuine question in my mind. In the 21st Century world, is there still anything left out that is really important to us but we are not able to measure it yet? You will be surprised to see below, the things that are inherent part of us but we never realised that we just can’t measure them - in a concrete manner!! I will be leaving you with lot of questions in this blog of mine because I really don’t know the answers and you, the reader of gloconomics, have to expand the hidden issue this time!!! Knowledge – How do you measure knowledge? We always say “the more knowledge we gain, the wiser we become” but how do we exactly know how much we have gained? And more importantly, are we gaining knowledge at the right pace or not? Do Degrees/Certificates/ Licenses/Years of Experience/Type of Job etc. measure knowledge? May be, but not objectively. Life –I remember the famous quote – Life is not about the no. of breaths you take but the moments that take your breath away! But this doesn’t measure life completely. We never keep a track of the no. of such moments we have lived to compare ourselves with each other!! J I am not saying we cannot differentiate between a good life and a bad life, the point is if we could have some measure to measure Life, probably we could have improved our lives further. We could have some benchmarks/goals/competitions like organizational KPIs that define Success ! Health – In different phases of life, health increases and deteriorates. Sometimes, we are healthy, sometimes we are weak but when we are healthy we don’t know how much healthy we are. It is only when we are weak we realise we have not been healthy lately!!! :-p Something very reactive!!! If I am allowed to give my wild thoughts here, just think if we had some universal standard indicator of health - we could monitor it, improve it, ignore it or do whatever we want to but at least we wouldn’t be caught unaware. Of course, we have thousands of clinical tests that give us the health status of different organs/parts of our body But I am desperately looking for some mathematical formula that takes all these measurements as parameters and gives me a single measure that gives me an answer to a seemingly simple question – How Healthy I am? Identity – What do you think who should be more famous for me - The street side snacks dealer in my hometown whose snacks I miss every now and then or Mr. Bachchan whom I have never met personally and of course never miss anything about him? Is the number of people who know you a measure of your identity? I don’t think so because in that case we would have seen some sort of ‘visibility number’ against every celebrity in the magazines by now. May be some sort of such comparative number for identity could have helped people bring out their best to have bigger identity and also, the world could have got more out of its people. 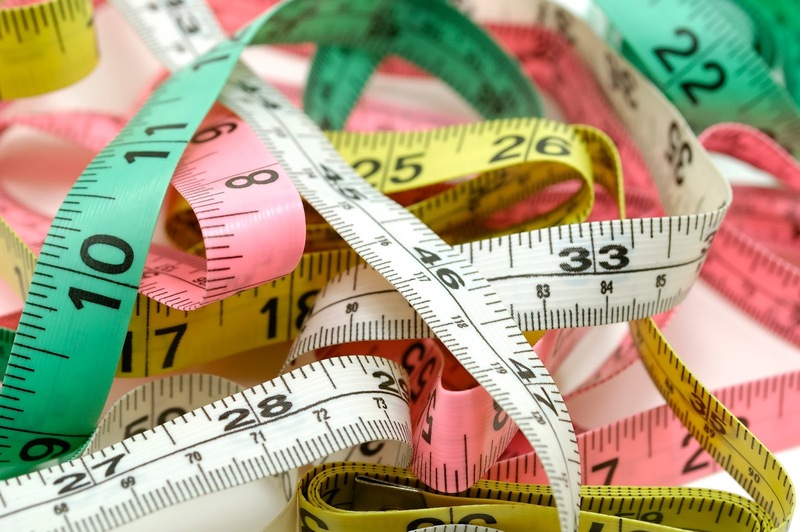 Change – Can we measure Change? It can be big or small but can we give a number and a unit to it? This might sound too complex but I believe if can have a measure for change, changes could have been easier. It could have been more certain and more manageable. I wonder once we have a measure for change, would change remain as change anymore? Success – All of the above – Knowledge, Life, Health, Emotion, Change define success in one or the other way. Everyone lives in this world to be successful. But unfortunately, we do not have a measure of it. Throughout our life we struggle to find how successful we are? And I guess, it is more because only you can know what Success means to you but trust me most of times you yourself will not know. Time/Money/Happiness/Health/Family we want it all but never in our life we come to know what mix of all of these would give us the highest success number!! Like they say in ‘Royal Stag’ commercial – Have I made it large? I would say I am one of the serious victims of this question. If ever, someone makes an objective measure for success, I am sure I will be among the first ones to use it!!! In the last 3 years of my blogging, I ‘feel’ this blog to be my favourite by far but again I don’t know how to measure this favouritism!!! May be somethings are not just meant to be measured!!! How many times have you desperately wanted the other person (may be your partner) to understand something without saying? How many times have you tried to manipulate your words to tell something you really want to but it gets interpreted in a completely different manner? How many times have you used: Actually, I would have loved to, Unfortunately instead of ‘NO’ and similarly May be, Can we, I wish instead of ‘I want it this way!!!’ ? I am like every other guy and I have a strong feeling that most of the times we make things complicated by not expressing it right! A wants B to understand something without saying, B is confused and unsure of his interpretation, B goes to C to discuss about his understanding of A, C comments to B with is own impression about A and ultimately B ends up doing something completely different than what A had expected in spite of the fact that B had put genuine efforts to fulfil what A wants. And hence the vicious circle!!!! 1. At times, You are yourself confused of what to express and how to express. Trust me there is no right or wrong expression! Expression is just an expression! A medium to speak your mind and heart. 2. Your mind and heart is not in sync. This appears to be the strongest reason why we do not express. Sometimes, our mind wants one thing and the heart other. We think, struggle, fight, do everything under the sun but when nothing one-sided comes out, we fail to express ANYthing. And most of the times leave it onto the other person to understand it and when the poor guy does SOMEthing (based on his understanding) he is destined to fail because you can’t be black and white together :-). 3. The Gender Bias. Truly, Men are from Mars and Women are from Venus. And you can’t be ploughing on Venus while being on Mars :-p ! You can look at it through a satellite, you can send a robot to study it but end of the day you have to estimate it what’s in there!  No point for guessing it right but god bless you if you got it wrong! You lose all your credibility like an established brand losing its lustre due to sudden quality failure! It is not about ‘what is right to express’ because that is all subjective. It might be right for me but can be wrong for you. It is just about ‘It is right to express! !’ Just express yourself! Right or Wrong! Leave it for deliberation. Unless you express, it is more probable to be wrong. So why not take a chance! Trust me Life is simpler when you express. A expresses to B what he wants, B reverts to A whether he can do it or he cannot do it. Both of them take a call! Chapter closed. Tick! What plans for the long weekend! We are going for a road trip! Wanna Join? Tick! Team, This Saturday is going to be crucial as we are going live on our project! Let’s make ourselves available over the weekend for the back up! Tick! Weekend Bonanza, Indulge yourself at Phoneix and get a chance to win for anything you buy! I have always wondered about the best way to deal with this constant inflow of information that comes with tremendous opportunities, responsibilities, risks, happiness etc. and tries to invade my every single moment. The “Tick” above represents the sound I generally hear whenever there is an email in my inbox. And this was just a small example of conflicting interests I go through almost every day. How to prioritize each one of them? No task comes with a label of amount of benefit/ loss or Joy/Sorrow it will bring with itself. As I had captured a glimpse of it in my last blog here, all such feelings travel in time and space with varied intensity at any moment. Some things are no brainer! Clearly you would want to pay attention to your boardroom presentation next day than dining out with friends last night at the cost of your preparation. But what to do with all other seemingly important or exciting stuff!! Everything on professional and personal front will try its best to grab your attention and take a piece off your time cake! 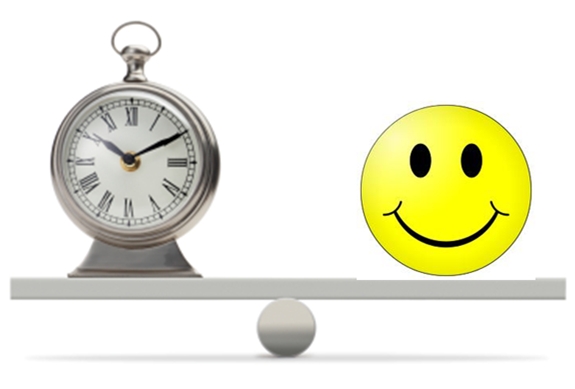 There is frequently a trade-off between being happy and care-free now versus being stable and content later. Many people will often say – resist instant indulgence! Sacrifice! Save! I have lived in both the worlds at different points in time! Have been care-free and indulgent at times and also sacrificing and perseverant the other! The rate (r) of depreciation of joy can be different for different people. Moreover, even the definition of joy can be different for different people. But what is more important is to figure out what gives you true happiness and do your best to get it! At times, giving joy to others can make you feel accomplished (like we do for our loved ones) or sometimes, you might have to compete and win your happiness!! Just go for it! There’s nothing wrong in that! The happiness missed today, is gone forever! You might get a different happiness tomorrow for your sacrifices today but what is missed now at this moment can never be lived again! It is good to ‘invest’ in happiness (and that’s what we do most of the times) but one should never (even unknowingly) kill today’s happiness in pursuit of tomorrow. The time of JOY is NOW !!! Last week I appeared for one of my dream certification exam. I had been literary dreaming of how happy I would be, how I would react, what I will do; ‘if’ I clear the exam. And finally the day came and I cleared it! No doubt I was Happy! I tried to do exactly what I had imagined I would do – kissed my score sheet (I know its cheesy!! :-p), called back home, updated my Linked In tag line etc etc. But to my surprise – I WAS NOT AS HAPPY AS I THOUGHT I WOULD BE. Somehow living the moment in reality was less joyful than living it earlier in ‘what-if I clear’ state. What went wrong? I have always been wondering what actually drives happiness. All through our life, we work/eat/play/sleep in quest of just being happy. 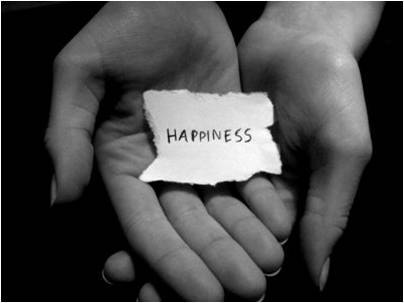 This blog of mine is an attempt to figure out why and how happiness happens (and so ‘y’ in Happ’y’ness) or fails to happen.It’s an effort to establish certain rules that can answer some of the questions that keep popping up in my mind (and probably your’s as well!!) with regard to this state. Interestingly, the laws mentioned below define how things went in numerous such situations in my life and I am sure you would be able to relate them with many of your life’s instances. The total amount of happiness in the world is constant. If I am happy today, someone somewhere has been forced to be ‘sad’. It looks quite a negative connotation but that’s what the reality is. Happiness + Sadness = 0. Winner is happy, Loser is sad. And hard fact of life is that the reverse is also true. Whenever you lose something and are sad, someone gets happy. It may not be a direct relation between you and him and moreover, the person who has been happy might not have even wished to give you sorrow to gain happiness for himself. But it happens. The promotion of one person makes him happy and simultaneously makes many others sad. Similarly, the suspension of one person makes him sad, while gives happiness to the one who is promoted to take on his responsibilities. There can never be any situation to happiness where the above rules are not applicable. If you feel there is, then you have probably confused your happiness with ‘pseudo happiness’ where you believe you are happy but in reality you are not! No one knows about it, no one can even figure it out - may be not even you at times! At times, I wonder what drives us to do something we want to do. Is it passion, fear, guilt or all of them together (or may be something else!). The thought crossed my mind when I was literally struggling to pen down my next blog here! I miss those days when I used to write at least once a week. Am I short of Gloconomic stuff now? No!! Ask my wife, whom I bother with such discussion every now and then!! Am I more occupied than my MBA period? Not possible!! I can never forget the burning of mid-night oil to sail through that period. Then what is stopping me to continue my hobby?? The only reason I find is the shift of the driver from Passion to Guilt with each passing day and I believe this happens with most of us, most of the time!!! I started off pretty well last year with my blog that gradually turned into Gloconomics.com with more than 200 hits a day. I worked on it passionately to bring Gloconmics into top 1000 websites in its domain on Technorati. I was approached by advertising firms to include their ads on my blogsite. It was all going pretty well and the only thing that was driving Gloconomics was my passion to blogging. But behind all these developments the fear of placements after MBA was fostering. And that fear changed my passion of blogging to a fearful force so that I can encash on my website. I started working more on my blog to make it better and better but I never knew I had already chosen a path of downturn. The fear can definitely make you perform better but only for a certain period of time. As fear is gone, the performance vanishes. 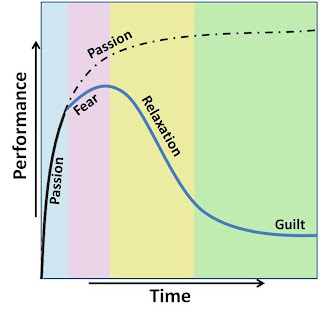 If you see the diagram shown above, the performance first increases exponentially while you are passionate to do something. Then the rate decreases, although performance increase, as the fear develops in the mind. 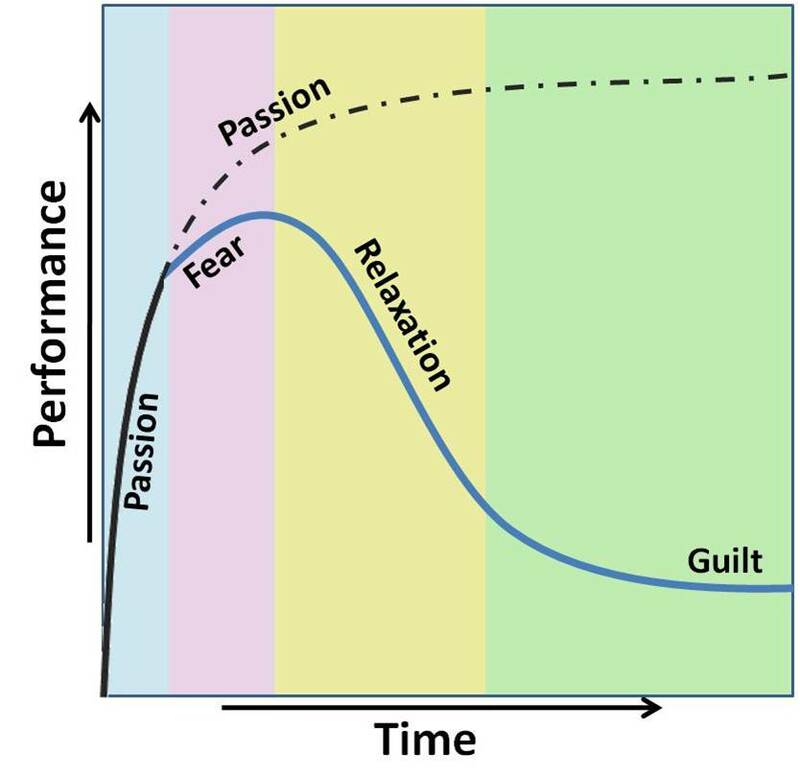 Gradually, as the fear vanishes, the person gets into a relaxation phase where the performance towards a particular activity decreases drastically until he/she realizes the guilt of missing that activity. For me it was the same thing, I went into hibernation as I got a good job and got settled with that. Although, I was always excited to write but the inertia of rest during that relaxation period didn’t let me write. Finally, today I am back to my blog to at least make this evident for you all so that, if you are also stuck in that circle of deceit, may be this blog would help you to re-live those moments you had when you were passionate of probably gaming, cooking, cricket, reading, dancing, biking, gymming. Things which you always wanted to do but are not able to continue anymore. Don’t let your passion ever go out of your performance and gradually, you will see a massive difference between those who work with passion and who work with guilt!! And that is what would make you class apart!! Did I exist the last moment?? I tried to go deep into the subject when I was bombarded by various questions on teleportation after my last blog. Questions like if it is possible to teleport living organisms. How far have we reached to make teleportation, a reality? And some apparently teasing but seriously genuine questions like if I am afraid of extinction of the industry I am into (Logistics and Supply Chain). I tried to dig out some interesting information that would possibly answer the questions you and I have in mind with regard to Teleportation but I must say that it is one subject in which the more you explore, the more confused you are. Well, after being really convinced about feasibility of teleportation with the initial readings a did on internet by various people, once I again I felt back to square one when I encountered an interesting discussion about the spiritual laws this technology is bound to break. As explained by scientists: Teleportation simply means ‘deconstruction’ of an individual or an object at point A and subsequent ‘reconstruction’ of the exactly same object point B in a fraction of second, irrespective of the distance between the two points. This makes one thing very clear, as this is a ‘process’ it is bound to take TIME. So technically speaking, this process breaks the continuity of existence, even if for a billionth of a second, therefore, effectively, as per current law, killing the individual. This brings up a very valid question- if there is indeed a soul, or some sort of unique life-force that is a part of each human individual, what happens to it when a person is taken apart, atom by atom, and "teleported?" Is it detached and subsequently reattached upon re-materialization, is it taken apart along with the rest of individual and reassembled as effectively as his or her more material aspects, or is it simply lost somewhere in the process? Will the first test subjects be reconstructed without any ill effects, or rematerialize as mindless vegetables, empty bodies without thought or awareness? Only time will tell for sure. As far as teleportation of human being is concerned, there is a big mental block (build by all our childhood scientific and spiritual study) that needs to get vanished first to further look forward to this technology. I was just browsing the internet for something new and interesting and fortunately came across a really nice article on teleportation. As I was going through the text, my imagination with regard to the capabilities of teleportation went really wild and unrealistic (Well! as of today). Just imagine if matter could travel @ speed of an electronic wave. The successful testing of Large Hadron Collider (LHC) last year, is a clear cut indication of there being something that is still hidden from mankind. Something that is way beyond what Science has been able to explain which has got the potential to challenge all the existing limitations to speed of matter. Teleportation – The capability to transport the matter through a process of dis-integration and integration at the destination point. 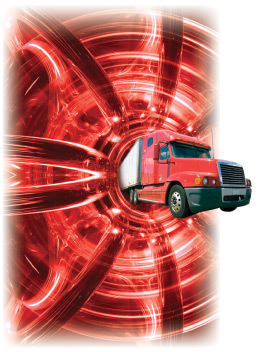 The technology that will bring a paradigm shift in the transportation of goods around the globe. Looking at the growing congestion in transportation infrastructure and the grid-lock constraining the growth of economy, teleportation is going to be the holy grail for transportation. Just imagine, the journey of thousands of miles will be done in seconds that too without the use of any road infrastructure or diminishing fossil fuels. If transportation takes a leap to teleportation, what would happen to all the cross border custom regulations? How the mass inflow-outflow will be controlled by any country. The even bigger fear will be that this technology is going to be “the mother of all Job killers” by making the heavy vehicle industry and millions of truck drivers obsolete. But it will be interesting to see the emergence of some interesting job, may be like, Teleportation mass-flow controller, Teleportation analyst etc. Being associated to logistics industry, I am equally excited and concerned about Teleportation but as it is said change is the only thing which is constant. Things would never remain the same in future as they are today. From postal letters to Emails, from landlines to mobiles, from radio to iphone, technology has always been embraced by mankind and has always conquered in all spheres of life making the life of people better, faster and easier. I am waiting for the day when I would no more have to wait for my mom’s next visit to taste her hand-made curries. She would just teleport the same to me before lunch and it would reach me fresh and hot.. In today’s dynamic and competitive business environment, organizations are striving hard to find their sustainable strategy for growth and stick to it. In many cases, the strategy gets obsolete before it is put into practice because of factors like change in customer needs, emergence of new technology, rise of new competitor etc. In such a scenario, it gets all the more important to feel the pulse of the end customer well in time and proactively act on it. The two parameters that drive the interest of the customer in the company’s product or service to a large extent are ‘liking’ to the product and ‘need’ for the product. Each organization is bound to have the products lying at different levels of ‘likes’ and ‘needs’ in their portfolio. As the time progresses these products keep changing their level of liking and need based on customers’ perceptions and expectations. The success of the organization thus largely depends on the extent to which their customers like to use the product/service and the extent to which they need it. As mobile phones came into picture in 1990s, ‘pager’ went into a category of low like and low need because the expectation of the people had gone beyond merely receiving the text messages and pager was limited to its conventional single application. The mobiles phone provided a higher personal touch by enabling them hear the voice of their loved ones and also a good number of useful applications along with that. For the products in this cell, the organizations need to re-define their product value proposition and take a call whether to develop the product further to align it with the market needs and liking or come up with an entirely new concept while divesting from the existing product. Constraints like price, health, non accessibility etc put the product into this category at times. Fast food restaurants, Adventurous tours and travel agents, Luxurious cars etc are all highly liked product with no real need at first place. Also products like ‘Colgate’ tooth paste, enjoyed the maximum market share in spite of better products in the market because customers were so much used to the product that they didn’t want to shift to even a better tooth-paste that had already created higher levels of ‘need’ like ‘long lasting freshness’, ‘nice odour’ etc. The success of such product/services lies in how they can create a need for the product and are able to make the customer understand and feel the need. The need can be ‘networking need (LinkedIn)’, ‘enjoyment need (Disney)’, ‘status need (Audi)’ or anything without which a customer feels incomplete. And once a need is created, the product is bound to succeed as it already has a high level of liking. 3. Regulatory requirements that enforce the use of the product/service. As per the lean principles under Japanese philosophies any type of search is a Non value adding activity in the value chain. So any action that vanishes/simplifies/guides the search for any information or product becomes a need and thus gains importance. Search engines like Google, Yahoo, Bing etc have provided a platform for people to search efficiently and quickly on the internet and thus serves the needs (of getting the right information) of the customers. In spite of the fact whether we like searching or not, we have to do it whenever we need what we are looking for. Another big example is the Pharmaceutical Industry. Nobody likes to have medicines but then nobody can afford to ignore them, when sick. The success of any pharmaceutical product is totally dependent on the extent of need it creates through the benefit it brings to the consumer. For a product in this cell it becomes necessary to titivate the product features while maintaining the same foundation to attract customers and make them ‘like’ the product/service. Instant and click-free search facility in Google, taste or ease of use in pharmaceutical products, are all such add-ons that add more and more value to the basic product and make them more likeable and user friendly. Almost no product/service can remain in this cell throughout the life cycle. Although the product might enjoy the liberty of being in this cell till the time it is competitively responsive to new substitutes and rising customer expectations. Websites like Facebook, Google, LinkedIn are moving towards higher levels of likes and needs with their every move. In a particular customer segment, Apple products (iPhone, iPad etc) currently enjoy being a ‘high like’ and ‘high need’ product. There is a class of people (like business executive) who have strong desire (thus liking) of this product and they also need it to maintain their status in their circle. For the product/service in this cell, the biggest challenge for the companies is to sustain the position of their product/service through continuous research, development and innovation. There is a trade-off between investments in sustaining the current product/service at its position and creating new products to replace the obsolete ones. An organization may employ different strategies for different product/services i.e. 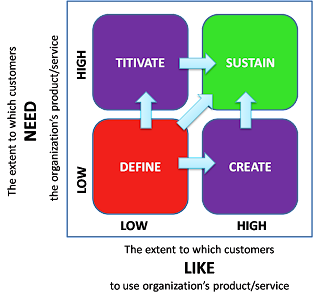 a single organization can occupy different cells in the framework above and organizations may transition to other cells over time by following distinctive strategies. Expectation Change Time is the time frame in which customer’s expectations from the product climb to a higher level thereby demanding more out of the product. HR TO FACE THE COMPLEX TRIO SOON..
As the world stabilized after the two world wars and was progressing rapidly, Gen X (1965-1980) took the baton from baby boomers. This ambitious generation is willing to work hard day in and day out. They have built back up and status for themselves along with their previous generation. Thus started the trend of Double Income at home when both the parents used to go out and were the bread winners for the family. Their next generation, Gen Y (1981-1995), got most of the things they needed and much more. They were born with silver spoon in their mouth as their parents and ancestors had already made riches for them. They are the ‘lock and key’ generation i.e. they have learnt to be independent from their childhood when both their parents used to be out at work. It’s this generation that is ambitious and family oriented at the same time. They are dynamic and are more in search of something that appeals them rather than anything that pays them. So it is getting increasingly difficult for today’s HR to design policies in the organization. On one hand they have retiring or about to retire baby boomers and Gen X who have different needs in terms of rewards and benefits and on the other hand there is Gen Y, which is purely looking for Autonomy, Mastery and Purpose over monetary rewards in the long run. They do not want to stay at one place for long and are impatient. Since they have no stable choice, it is this generation that is very difficult to retain. Moreover work-life balance is one of their top most priorities. The generation that would be soon a part of the workforce is Gen Z (1996 onwards). This generation is a digital wizard and is a step ahead of Gen Y when it comes to e-stuff. They have their own SMS language that is sometimes non-interpretable even by the late Gen Y fellas – lol, roflao, np, hf and many more such short forms. The main challenge is soon to arrive for HR when they have to take care of all these 3 generation employees simultaneously and postulate policies keeping in mind their behaviors and needs. So gear up the HR professionals – lets understand more about these generations and get ready for our future complex roles! Sometimes, not feeling well can be a boon to you! And this blog of mine is an outcome of uneasiness because of changing weather. Not feeling like doing anything, I started reading an interesting book that caught my attention with its very 1st line: “There are three kinds of people in this world….” Before I could finish the first paragraph itself, a complete new dimension of thoughts struck my mind and I was forced to get interrupted and start writing here. I never wanted to let this thought vanish because of my indulgence in that book. What is the world beyond your thought? Does this question make sense at all? You are just not supposed to know the answer to this. And if you do, you’re lying of course, because that means you have thought about it! You don’t know what you “don’t” know! Then how one person knows more than the other? Or rather I should say how one person knows that he knows more than the other. I tried to explore what triggers a new thought in mind! The first thing, I believe, is accepting the fact that there IS a world beyond your thoughts. If you are open to new ideas and don’t trap yourself in the scope of your knowledge you will find the plethora of knowledge waiting for you to be explored. Second is to get out of the boundaries of learning what you know you don’t know. Like I know that I don’t know how to read an X-ray; I don’t know how to play golf; I don’t know how to play guitar. There can be hundreds of things which I know I want to learn but if I will go with the mindset of learning things first and then exploring the new ones, I would probably spend my whole life in the former and would still be left with countless things to learn. The idea is to explore while you learn. Learn and innovate in parallel. Broaden your horizon of learning while broadening the scope of the existing knowledge. Had Aryabhatta settled down with the mere invention of ‘zero’, we would have never reached the extremities of mathematics, we are at today. Questions are everywhere! It is not always necessary to challenge the existing facts and notions and then trying hard to find something new in the fight to disprove them. They might be right! We need to explore what has been unanswered till today! It can be as funny as why the participants for Miss UNIVERSE are always ONLY from earth!! J On a serious note, Just imagine the depth of the information you will get if you genuinely question the questions like the one above. The Business today needs the same thing. The innovation and research is no more limited to science and technology. An organization with 1000 people is not just about 2000 working hands and eyeballs but more about 1000 thinking minds with each producing 70000 thoughts in a day. That means around 24 millions thoughts are generated in that company premises assuming 8 hrs of working at the rate of 1 thought per person every 1.2 seconds. But Alas! There is no system in place to constructively capture or align even a fraction of these thoughts. We can either wait for the systems to be in place first or start from ourselves to be the change agents for the future. So let’s go explore the world beyond our thoughts. Find one thing each day which you didn't know earlier. And you will see the difference you bring to world!! 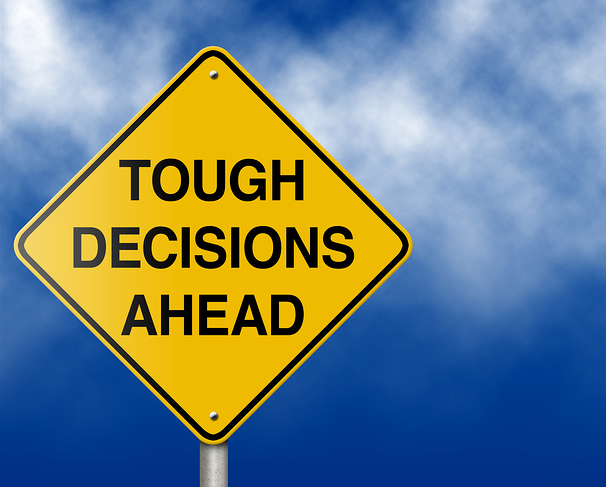 A few days back, I just sat thinking – what drives emotions, not only personal but the business decisions? There has been a paradigm shift in the way business is driven; not just by logic but by emotions as well. Infact, logic is a subset of emotions. Had it not been so, the same person, in the same environment, would not have different productivity on different days! Brain is what makes you think rationally and your heart is behind your emotional decisions!! This is what I had known since my childhood. But this belief of mine was lately shattered in the SPJCM HR classes. Firstly, it’s not your heart behind your emotions – it’s your amygdala – the goose bumps you feel, the shivering, anger, love, hatred – all is triggered by amygdala – the place where emotional states are stored as memories. So the red heart people exchange on Valentine’s Day is not the one that triggers love. Human beings are more or less rational in their behavior. Antonio Damasio, a Portuguese biologist, found out by experimenting on his patients that the ones whose amygdalas were damaged demonstrated irrational behavior. They did not display normal emotional reactions such as fear or thrill after reading a horror story or for instance affection towards their spouses and children was also missing. A man with a damaged amygdala might not experience fear or display panic, even in the front of a lion. Thus it is the amygdala that brings rationality to ones behavior and a loss of emotionality is what leads to irrationality. However, a person who has been hijacked by emotions might display irrational behavior. For example, a person who is drowned in his own thoughts might not return a smile to his colleague. That colleague might just look for an opportunity to take revenge on this person. So, I think that rationale behind rationality is not an outcome of logic but of emotions. How China controls Yuan value against USD and other currencies? It is all about being positive..
Notes on Gloconomics by Gaurav Chawla are licensed under a Creative Commons Attribution-ShareAlike 2.5 India License. (c) Globonomics Inc. 2010. Powered by Blogger.